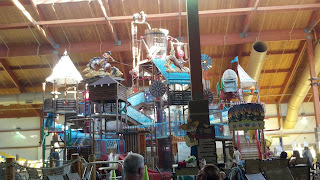 Recently, the family and I had the wonderful opportunity to spend a day and night at Fort Rapids Indoor Water Park in Columbus, Ohio. We arrived that the complex around 3pm. The front desk staff were friendly and efficient and quickly checked us in and gave us our wrist band passes to the water park. The check in area is clean and spacious with a huge fireplace and lots of 'old west' themed areas. It immediately gets you in the mood for your Fort Rapids water park adventure. The room had two large beds with a small living area. There is a huge parking area that practically guarantees convenient unloading of the car no matter where your room is. We were on the first floor and were parked near the side entrance with easy access to the room. There are two wide screen tvs with cable and game hookups for the kids, although we didn't take advantage of that feature. Our room had a small dryer to dry towels and swimsuits, a microwave, refrigerator, and coffee maker. All the necessities! Of course, the boys immediately wanted to head for the water park. So, off we went - while the complex is huge, it's a short walk to the water park. The water park itself it 60,000 square feet of aquatic adventure. You will find thrill levels from the ‘toddler’ level up to the high-speed water slides and everything in between, including the relaxing river (Cowboy Creek) and huge hot tub. The Kiddie Korral caters to the youngest set with several areas for your youngsters. The Rascal Roundup is a multi-level structure where the kids can explore and get drenched by the huge tipping water bucket. This attraction alone will keep the kids occupied for a long time! My family especially enjoyed the water slides. You get a 1-person or 2-person inner tube and climb up several stories of stairs to the top of the slides. You then pick your slide - Black Out Pass was our favorite - in this one, you speed down the dark slide into a huge bowl where you spin around in the bowl until you get to the bottom - then you shoot down yet another slide into the pool. My husband and I rode this slide with my sons several times. Ambush Alley and Raging Bull are similar slides that will allow racing. We had several races and it seemed that my kids always won for some reason! We also enjoyed the Activity Pool and played several games of family basketball there. This area also has a more traditional pool area if that is more your speed. There is also a rope challenge that my 9-year old couldn’t get enough of. The resort has 227 rooms and 60 suites. There is dining on the premises with all sorts of convenient dining options off-premises if you desire. 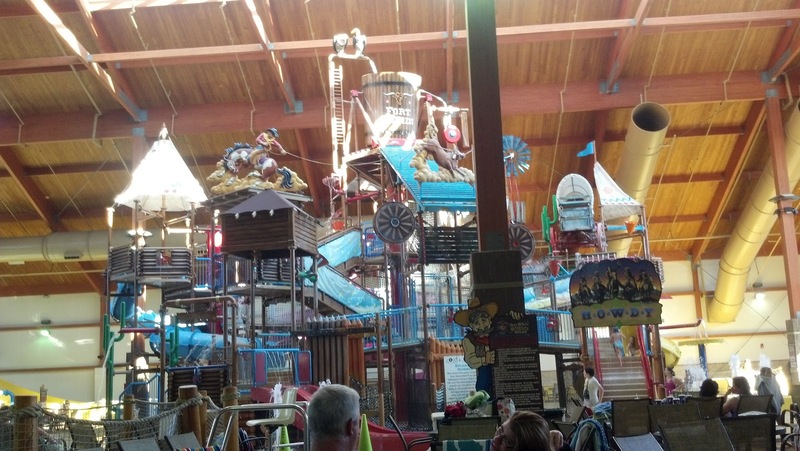 At the end of the day, Fort Rapids Water Resort is a great way for the family to spend a fun-filled day or two or three. I highly recommend Fort Rapids for great family fun in the Columbus, Ohio area! Disclaimer I received a free night to Fort Rapids and the water park for an honest review all opinions are 100% my own. Wow... the waterpark looks amazing! How much fun is this! I would love to spend a day here. It looks like a waterpark I want to visit. Great review. I hope to get to visit one like that some day soon. My kids would definitely love this! I don't know why they love those huge slides so much. They terrify me! That looks like an awesome place that I'd love. I don't like the fancy shmancy types of places, and this looks just like something the whole family could love. This sounds like a really fun place! My boys would love the water slides too!! The resort looks like the place to go in Ohio!